A wideband frequency comb ensures that the crosstalk between multiple communication channels within the same optical fiber is reversible. Scientists at UC Diego have increased the maximum power at which optical signals can be sent through optical fibers, breaking key barriers that limit the distance information can travel in fiber optic cables and still be accurately deciphered by a receiver. This advance has the potential to increase the data transmission rates for the fiber optic cables that serve as the backbone of the internet, cable, wireless and landline networks. The research is published in the June 26 issue of the journal Science. The new study presents a solution to a long-standing roadblock to increasing data transmission rates in optical fiber: beyond a threshold power level, additional power increases irreparably distort the information traveling in the fiber optic cable. “Today’s fiber optic systems are a little like quicksand. With quicksand, the more you struggle, the faster you sink. With fiber optics, after a certain point, the more power you add to the signal, the more distortion you get, in effect preventing a longer reach. Our approach removes this power limit, which in turn extends how far signals can travel in optical fiber without needing a repeater,” said Nikola Alic, a research scientist from the Qualcomm Institute, the corresponding author on the Science paper and a principal of the experimental effort. In lab experiments, the researchers at UC San Diego successfully deciphered information after it traveled a record-breaking 12,000 kilometers through fiber optic cables with standard amplifiers and no repeaters, which are electronic regenerators. The new findings effectively eliminate the need for electronic regenerators placed periodically along the fiber link. These regenerators are effectively supercomputers and must be applied to each channel in the transmission. The electronic regeneration in modern lightwave transmission that carries between 80 to 200 channels also dictates the cost and, more importantly, prevents the construction of a transparent optical network. As a result, eliminating periodic electronic regeneration will drastically change the economy of the network infrastructure, ultimately leading to cheaper and more efficient transmission of information. The breakthrough in this study relies on wideband “frequency combs” that the researchers developed. The frequency comb described in this paper ensures that the signal distortions — called the “crosstalk” — that arises between bundled streams of information traveling long distances through the optical fiber are predictable, and therefore, reversible at the receiving end of the fiber. The photonics experiments were performed at UC San Diego’s Qualcomm Institute by researchers from the Photonics Systems Group led by Radic. 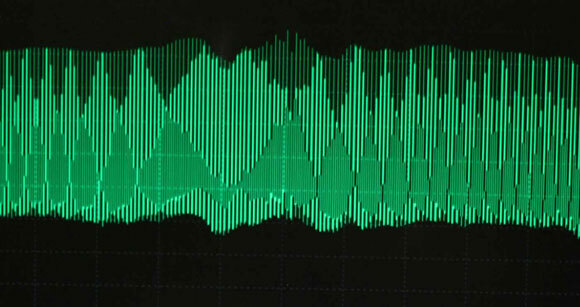 Pre-distorted waveforms are imprinted on frequency-comb-originating carriers in the Data Pre-Distortion (DPD) block. The information is fully restored at the output of the optical fiber, which is free from the nonlinear crosstalk. The UC San Diego researchers’ approach is akin to a concert master who tunes multiple instruments in an orchestra to the same pitch at the beginning of a concert. In an optical fiber, information is transmitted through multiple communication channels that operate at different frequencies. 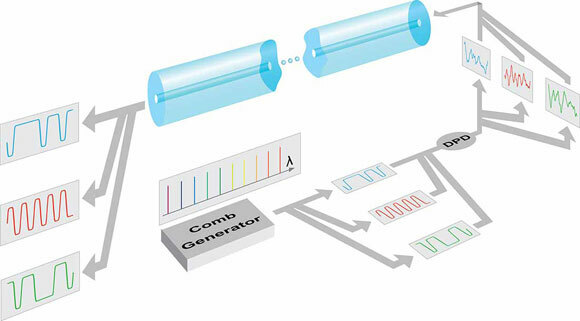 The electrical engineers used their frequency comb to synchronize the frequency variations of the different streams of optical information, called the “optical carriers” propagating through an optical fiber. This approach compensates in advance for the crosstalk that occurs between the multiple communication channels within the same optical fiber. The frequency comb also ensures that the crosstalk between the communication channels is reversible. “After increasing the power of the optical signals we sent by 20 fold, we could still restore the original information when we used frequency combs at the outset,” said UC San Diego electrical engineering Ph.D. student Eduardo Temprana, the first author on the paper. The frequency comb ensured that the system did not accumulate the random distortions that make it impossible to reassemble the original content at the receiver. The laboratory experiments involved setups with both three and five optical channels, which interact with each other within the silica fiber optic cables. The researchers note that this approach could be used in systems with far more communication channels. Most of today’s fiber optic cables include more than 32 of these channels, which all interact with one another. In the Science paper, the researchers describe their frequency referencing approach to pre-compensate for nonlinear effects that occur between communication channels within the fiber optic cable. The information is initially pre-distorted in a predictable and reversible way when it is sent through the optical fiber. With the frequency comb, the information can be unscrambled and fully restored at the receiving end of the optical fiber. “We are pre-empting the distortion effects that will happen in the optical fiber,” said Bill Kuo, a research scientist at the Qualcomm Institute, who was responsible for the comb development in the group. The same research group published a theoretical paper last year outlining the fact that the experimental results they are now publishing were theoretically possible. Other members of the research team were Evgeny Myslivets, Lan Liu and Vahid Ataie, all of the UC San Diego Photonics Systems Group. The authors thank Sumitomo Electric Industries for fibers used in the experiments, and Google Inc. for support of this work through a Google research grant. The University of California has filed a patent on the method and applications of frequency-referenced carriers for compensation of nonlinear impairments in transmission. Be the first to comment on "UC Engineers Break Distance Barriers for Fiber Optic Signals"